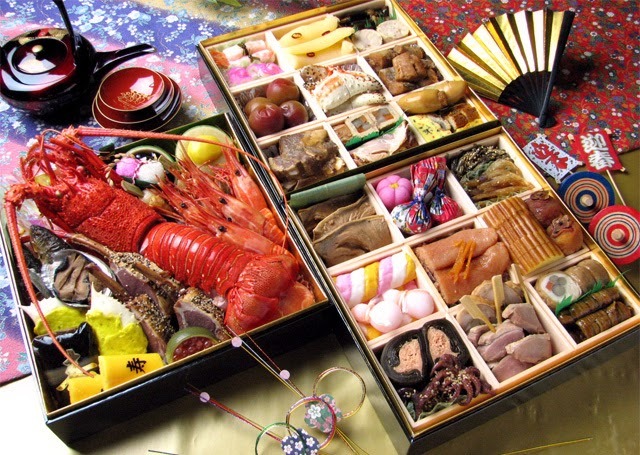 New Year's Day, which is called 正月（しょうがつ）/shougatsu/ in Japanese, is one of the most important holidays in Japan!! Some people travel overseas during holidays, but we mostly go back to our own hometown to see families. Unfortunately, I can't visit my hometown this coming New Year's Day... :'( But instead, I'm going to go back to Japan at the end of January. I can't wait!! Do you know what we do on New Year breaks? We eat 年越しそば tonight! 年越し/toshikoshi/ means "to enter a new year". You know, Soba noodles are long and thin, so it symbolizes "long life". People ring the bell on 大晦日（おおみそか）/oomisoka/ New Yea's Eve. I love this holy moment when the bell start ringing. My brothers and cousins used to try to stay up late, and walk to the shrine in neighborhood, ring the huge bell in the shrine. It was really fun. Each foods have a special meaning. For example; 黒豆（くろまめ）/kuromame/ black beans, means "healthy life" since the word まめ/mame/ indicates "healthy". It also means "faithful" or "diligent", so people wish "healthy life" and "to be diligent" by eating 黒豆. Children receive some gift money on New Year's Day. That's why they love this day! New Year's Holidays is the season we definitely get fat. Definitely. 良（よ）いお年（とし）を /yoi otoshi wo/ I wish you'll have a good new year! This is the common greeting phrase used before New Year.